Remote desktop is a famous technology/term - You don’t need to worry about this technology jargon, it’s very simple to understand and USE. Remote desktop is the way of managing computers on network, distribute software and its plug in and provide online support to end-user without leaving your desktop means you can solve your customer problem anywhere in the world without leaving your office. You are working as a technical support person in organization based in NY, US and organization has offices throughout the world. Your organization branch office based in Denver, US using an application and they have some configuration problem, and they need support staff to solve the problem. Now support staff as a rule of thumb should travel across the region and reach branch office and solve the customer problem. In this case you will have to bear cost and other expenses in mind but if you want to reduce cost and provide on time support to your branches so you have one obvious solution to resolve this entire problem, you can consider many solutions for remote desktop available in the market. Yes, you need a solution that could solve your problem, the solution is called remote desktop solution will resolve your issue. But before going for any remote desktop solution, you should consider few things, its security whether solution or remote desktop tool is secure or not, second its support, how they support you after selling the solution. There is a very convenient and effective remote desktop solution available in the market, you can securely do the entire activities online and provide on line real time support to your branches or provide support anywhere in the world with REDUCED COST. 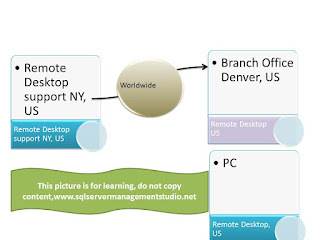 This is the ideal situation where you can use remote desktop technology to access remote desktop from you pc.